Today, Friday the 13th, it finally dawned on me why I keep getting calls for a deadbeat family: My phone number ends in 13. Of course! And I had the luck to pick that one, because phone companies in California generally give customers a choice of new numbers. If you pick up a bad vibe from the first number you’re offered, you can request another one. Thirteen isn’t unlucky everywhere, so California – being multicultural – has a bunch of numbers of concern. Take four. In China, the word for “four” sounds like the word for “death” – definitely a non-starter for the Golden State’s Chinese heritage. In Japan, four is unlucky and so is nine; don’t look for either in LA’s or San Francisco’s Japantown. Speaking of nine in Mexico, cats are said to have seven lives, not nine, and the unlucky day is Tuesday the 13th. 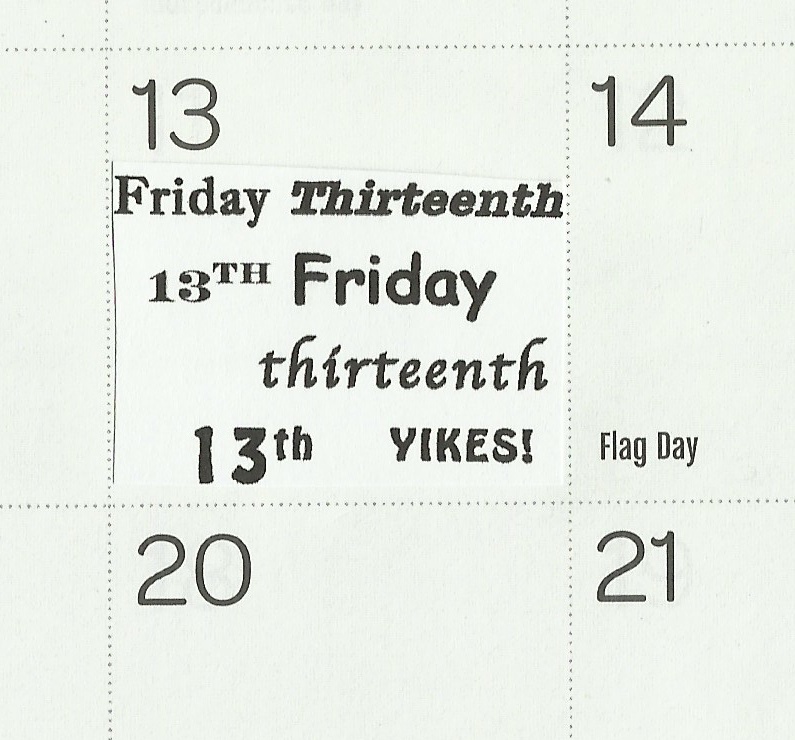 Friday the 13th passes like any other day in San Diego, which has one of the highest populations of Mexican ancestry in the United States; but beware of Jan. 13, which will fall on Tuesday. If you’re Puerto Rican, as my family is, both Tuesday and Friday the 13th are bad luck. In the closest town to me, the cash registers at the family owned supermarket print Bible verses on the receipts. It’s startling at first to see proselytizing right after the total owed, but eventually it feels like a bit of small-town charm, as the chosen verses usually have a community-minded message. For instance, during a wave of break-ins, the receipts said “Ephesians 4:28.” That’s the one that goes: “Let him that stole steal no more: but rather let him labour, working with [his] hands the thing which is good, that he may have to give to him that needeth.” It’s not unusual to overhear customers comparing what the register prescribed for them: “Mine is Proverbs 3:5!” “Well, I’ve got Galatians 5:22-23!” Lately, perhaps because improvements at the lake are expected to bring more strangers to town, the registers have stepped it up to two verses per receipt. What nobody wants is a bill that adds up to $6.66. The cashiers keep 25-cent candies at the register for exactly this reason, kicking the bill to $6.91 if the customer requests it. How unlucky are all these numbers? Four comes up most frequently in Mega Millions lottery drawings, and 13 ranks a respectable 22nd. Yesterday, 13 helped one lucky lucky ticket holder to win $195,783 in the California Lottery’s Fantasy 5 game. Oh, well – there’s really no accounting for superstition.